The Chandigarh Administration here today imposed property tax on commercial, industrial and institutional property at the rate of 5 per cent of the rateable annual rent within the MC limits. “The government buildings have also been put under the net of service tax at 75 per cent of the rate,” an official spokesman said here today. The tax, to be paid in two instalments would be effective from the date of the notification of the Self-assessment Scheme up to March 31. With the imposition of the tax at 5 per cent of the annual rateable rent, the Administration has rejected the Municipal Corporation’s resolution approving the tax at the rate of 2 per cent. The direction of the Administration has come after the politicians in the Municipal Corporation (MC) failed to generate resources for making it financially strong enough to take the responsibility of the development of the city. The spokesman said there would be one bill for one property. With the direction, the way has been paved for the tax after years of tussle between the MC and the Chandigarh Administration. The Municipal Corporation had passed the Self-assessment scheme early this year but the imposition was pending due to a difference of opinion on the rate. The Administration had earlier notified a rate of 10 per cent as passed by the Municipal Corporation, but it could not be implemented as the House took a second thought and did not frame bylaws. The spokesman further said if a person deposited the tax for the full year on or before the due date, a rebate of 10 per cent would be allowed to him; if half yearly tax was deposited on or before the due date, a rebate of 5 per cent would be allowed. The minimum chargeable tax would be Rs 50. If any property owner does not want to opt for the assessment under the Self-assessment Scheme, the department would assess the annual rateable value of the property itself and for that it will charge 25 per cent over and above the rates prescribed for the first year of assessment. War widows and war heroes, freedom fighters will be exempt from the payment of property tax. The government buildings will be assessed as per the C category decided by the Municipal Corporation. Mayor Subhash Chawla has appealed to the Union Home Minister Lal Krishan Advani to get the notification withdrawn respecting the feelings of the elected body. He said the direction would be seen as a rejection of the will of the people. BJP president Yashpal Mahajan has demanded a complete withdrawal of the direction saying the Congress had “deceived” the people by passing property tax provisions in the Municipal Corporation despite promising a tax-free regime before MC elections. The Governor Punjab and UT Administrator (designate), Justice O.P. Verma, arrived in the city this evening, accompanied by his wife, Ms Sobha Verma, to an official welcome at the UT Guest House in Sector 6. Justice Verma's mother, Ms Anita Devi, 93, arrived with the family by the Shatabadi to witness the swearing-in ceremony to take place tomorrow morning at the Punjab Raj Bhavan. Justice Verma arrived with all paraphernalia and security which accompanies his status. He was driven down from Shimla in a silver Mercedes of the Punjab Governor and accompanying him was ADC Paramjit Gill. The welcome party was led by Mr Jagjit Singh, Minister of Local Bodies. Also present were the Chief Secretary, Mr Rajan Kashyap, the Adviser to the UT Administrator, Mr Virendra Singh, The DGP, Punjab, Mr M.S. Bhullar, Secretary to Governor, Mr Subodh Aggarwal, UT Home Secretary, Mr Raminder Singh Gujral, UT Finance Secretary, Mr Karan Avtar Singh, Chairman of Chandigarh Housing Board, Mr G.K. Marwah, IG Chandigarh Police, Mr Rajesh Kumar, the DC, Mr Ramsekhar and the SSP, Mr Gaurav Yadav. Justice Verma said he will speak to the press after the swearing-in ceremony tomorrow. He was Lok Ayukta in Himachal Pradesh before being appointed Governor. Meanwhile, the Governor, Lieut-Gen J.F.R. Jacob (retd), will be given a farewell at 10.30 am. There is good news for residents putting up in Sector 33 and some other southern sectors. They need not buy electric pumps for bringing water to the top floors of multi-storeyed buildings in summer this year. The water pressure will improve remarkably in “a few days time” with the installation of “machinery high heads” at Sector 32 water works. The move to instal the “machinery” is significant as the residents living in Sectors 33, 34, 35 and 31 would directly benefit from it. Confirming the information, Chief Engineer with the municipal corporation of Chandigarh V.K. Bhardwaj says: “Even those putting up on the top floor would be able to fill up their buckets with the installation of the machine”. Regarding the shortage of water in the city, he asserts: “At present, the requirement of water in summers was 90 mgd, while the supply was just 65 mgd”. The problem, he asserts, would be resolved to a large extent with the fourth phase of Kajauli water works becoming operational after about two years. “Till then we are trying to improve the supply by cutting down on wastage,” the Chief Engineer claims. Even as the authorities are claiming the adoption of measures for checking water problem, the situation, more or less, remains the same. Every morning residents, putting up on the first or the second floor, wake up at about six in the morning. They rush to the balcony for tugging buckets of water. At about 9 am, the taps go hissing. Only then the residents realise that either the kitchen requirement or the bathroom water has not been filled. This is not all. Sometimes, the residents have to forgo washing clothes. No wonder, low pressure and regulated water supply is leaving the residents high and dry. Taking a serious view of reports of fake admissions in the affiliated colleges, Panjab University has drafted an action plan to plug the loopholes in the existing system from the forthcoming academic session. The university was a witness to a number of complaints of fake admissions during the commencement of the current academic session. Most of the cases pertained to the colleges in the Ludhiana zone of the university. All efforts were made to trace the genesis of the trouble. However, “little” or nothing significant has happened on the account of tracing the roots of the problem. It was felt that the university should question the accused students to tap the ‘birth place’ of the trouble. Hands of certain university officials in handing out the fake degrees was not ruled out in the preliminary stages of investigations. The university has held a series of meetings to draft an action plan ‘to check with immediate effect further forgery of university certificates and confidential results by unscrupulous elements’. The committee made a close examination of ‘defrauding candidates’ and concerned university quarters. That all the candidates did not turn up for the interview could be anyone’s guess. The university has now summoned a meeting of the committee to approve the new guidelines to curb the menace. The committee members include Prof Deepak Manmohan, Dr A.S. Dua, Principal A.C. Vaid, Mrs Harmit Kaur, Mr Rajinder Bhandari, Prof Veer Singh and Dr Sodhi Ram, Controller of Examination. The university will publish a proforma for issuing the confidential results. These will be numbered like other degrees and detailed marks cards. The confidential result will not be given by hands but sent to the mailing addresses of the candidates through registered post. The university signatory to the confidential results will be an officer not less in rank than an Assistant Registrar or above and office stamp of the signatory needs to be fixed on the document. The university proposes to send the specimen signatures of signatories to all principals of affiliated colleges to enable them to match the same at the time of admissions. These can help in checking forgery at the first step. In case of further doubt the documents can be sent to the university for verification. Importantly, admissions on basis of the confidential results will be treated as provisional subject to the condition that the DMC will be submitted to the college at the earliest. The recommendations have been already sent to the Joint Controller of Examination for compliance. It is felt that in the forthcoming meeting the committee is likely to dwell on the genesis aspect of the problem. Alarmed at news reports about land at Kajehri village having been exempted from acquisition, the Chandigarh Administration today asked the Sub-Divisional Magistrate (SDM), South, Ms Madhavi Kataria, to physically verify if some unscrupulous elements were defrauding people by selling acquired land by palming it off as exempted land by quoting media reports as a tool. No land at Kajehri village (located just opposite the Interstate Bus Terminus, Sector 43) has been exempted from acquisition, well-placed sources told The Tribune. There is no change in the status of land which has been acquired in the past few years. A total of 130 acres have been acquired at Kajehri village and is valued at close to Rs 300 crore in the open market. And these are conservative estimates. Yesterday, a political party had issued a press note claiming to have got a portion of the land exempted from acquisition by requesting the UT Administrator, Liuet-Gen J.F.R. Jacob (retd). Official sources said no land at Kajehri village had been exempted from acquisition in the past couple of years and no notification had been issued to exempt any land. As per records of the Administration, 85 acres were acquired five years ago when notices were issued under Section 4 of the Land Acquisition Act, 1894. Another 45 acres at Kajehri were acquired three years ago and this included shamlat (common) land which had disputed ownership and the villagers lodged a complaint with the Administration. The owners of the land of both acquisitions have already received compensation from the Administration in the past 18 months, sources said. The UT Finance Secretary, Mr Karan Avtar Singh, confirmed that the SDM, South, has been asked to ensure a physical verification of lands acquired by the Administration. This will also check that no land acquired by the Administration was illegally sold off as land not being under acquisition, he added. Since the compensation of the lands have been paid, any one selling or buying it is illegal under the law. Sources pointed out that the Administration was startled this morning by the claim of a political party that exemption has been granted. Kajehri village is located just south of Sector 43. The prices of property have been rising there in the past three to four years. Official sources confirmed that 30 kanals (just a little more than 4 acres) have been exempted from acquisition in Darshani Bagh, Mani Majra. This is a densely populated part of the locality. The residents living in these four acres are those who had been resettled after being evicted from their village which was located where Sector 18 stands today. They were living in Darshani Bagh since 1950’s. A notification to acquire the land in Darshani Bagh was issued but after considering the claim of the residents, the acquisition of about four acres stands exempted. Since this morning media reports, people in Kajehri village had been euphoric and the Kajehri Residents Welfare Association even thanked the political party by issuing a press statement tonight. The District Courts complex in Sector 17 here had to be vacated here this morning after two anonymous telephone calls regarding a bomb in the complex were received. However, after a search by the bomb disposal squad, the calls turned out to be hoax. As a result of the hoax calls, routine work at the courts was affected for more than two hours. One of the call was made from a STD-PCO booth near Railway booking counter at the Inter State Bus Terminus, Sector 17, and the other from Zirakpur, Punjab, said police sources. A senior police official said efforts were being made to nab the caller after the STD-PCO operator at the ISBT provided some information about his appearance but he could not be traced. It is learnt that a telephone call by an unidentified person regarding the “bomb” was received at about 11 am (followed by another call). The courts complex was vacated, cordoned off and searched. A bomb disposal squad and sniffer dog squad searched every nook and corner of the complex but no explosive was found. The President of the District Bar Association here, Mr N.K Nanda, said work at the courts could resume only after 2 pm. We have long known and heard that Shiv Kumar Batalvi’s timeless poetry was born of the virgin wounds that love gave him. But there are other aspects of the poet’s life, which have failed to meet the public eye. When viewed in the light of these aspects, the real Shiv Kumar Batalvi comes alive — lovelorn, but ecstatic about life and more so about his future with his own family. Years after Batalvi’s death, his wife Arun Batalvi, cannot help recalling the warmth of her husband, who gave his all for the security of his family. In the city today on an invitation from the State Bank of India, whose employee Batalvi was, Arun talked about the little-known aspects of Batalvi — who was a poet less, and more a father and a friend. “All I can tell you is that he was an exceptionally caring husband. His soul rested in his children. When they threw a tantrum, he would set aside all his creative pursuits and attend to their call. His death naturally came as a shock, especially because it came very early in life. We were yet to build up a future, which he was looking forward to. After his death, life was more of a survival feat than anything else. I had to struggle a lot to raise my kids with dignity,” said Arun, who is now working as a librarian with Patiala University. Arun was in the city to attend a function organised by the State Bank of India in the memory of Batalvi. The show was opened by Arun, who first inaugurated an exhibition of pencil sketches on Batalvi by H.S. Sohal. Then she attended the musical evening which featured Batalvi’s songs. The songs were presented by Meenu Palta, Ajay Bakshi, Rajinder Moni and some others. Also present on the occasion was Meherbaan Batalvi, Batalvi’s son, who talked with a certain sense of pain about his father being termed an alcoholic. “The media keeps writing anything about him. I just want to make a point. There is a difference between someone who takes alcohol and someone who is a drunkard. My father was a balanced person. He did not fall about on roads under the influence of liquor. He just liked to consume liquor and knew how to conduct himself in any case. When people unnecessarily link up his habit of drinking with his final departure, it hurts us. We are proud of him and we would be happy if he is not dubbed an alcoholic.” Later, during the function, all those who rendered Batalvi’s immortal songs were also honoured. Six municipal councillors here today attacked the Punjab Urban Planning and Development Authority (PUDA) for failing to provide essential facilities here and claimed that it had merely become a commercial set-up with the sole aim of making money. The councillors — Mr Amrik Singh, Ms Manmohan Kaur, Mr Manjit Singh Sethi, Ms Harbans Kaur, Mr Manmohan Singh Lang and Mr Manjit Singh — said at a press conference here that PUDA was not only minting money from SAS Nagar, but, what was worse, it was spending most of the funds earned from here on the development of other towns. They said residents had been deprived of proper educational and health facilities. There was only one government senior secondary school in the town. PUDA had reserved 13 sites for government secondary schools in various phases out of which eight had been allotted to private schools at concessional rates. A deputation of these councillors had yesterday met officials of PUDA and the Departments of Health, Education and Sports to take up various problems being faced by residents. The councillors demanded, in memoranda submitted to the departments concerned, the reservation of the present site in Sector 62 for the holding of public and cultural functions and tournaments; the earmarking of a site in Sector 62 for the setting up of a mini secretariat in anticipation of SAS Nagar getting district status; and the cancellation of the allotment of sites in Sector 65 to private schools and their allotment for setting up a government girls’ college and a senior secondary school. The councillors further demanded the setting up of a government hospital and medical college in Sector 68 on the pattern of the GMCH, Sector 32, Chandigarh. They also sought the carving out of playgrounds for children between every two phases. Residents of this township are peeved over the “disproportionate” bus fares being charged for different destinations from Kharar even though the distances involved are the same. According to local residents, the bus fare from Kharar to Chandigarh is Rs13, while that for places like Kurali and Morinda is just Rs 5 even though all three places are 15 km away. Demanding rationalisation of fares, local residents said that even if inter-state tax has to be paid by bus operators for plying on the Chandigarh - Kharar route, the disparity of fares is too much. The fare on this route is almost three times than that charged for the same distance within Punjab. A large number of people, including government employees, teachers industrial workers and students commute between Chandigarh and Kharar daily. 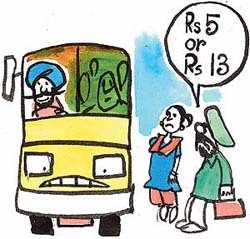 “The fares are high, especially for those belonging to the economically weaker section of society,” Sukhdev Singh, a daily commuter remarked “In the interest of the common man, fares as applicable in Punjab should be charged,”he added..
Senior officials of Chandigarh Transport Undertaking (CTU) said fares for long-route and local routes are structured differently. Buses connecting Kharar to other towns of Punjab are long-route buses. “The economic and commercial parameters governing short and long-routes are different,” an official commented. According to CTU officials, the fare applicable within Chandigarh is charged till the Chandigarh-Punjab barrier, from where the fare as notified by the state government is charged. This adds upto Rs 13. “If the fare on the Chandigarh pattern was to be charged on this route, it would amount to Rs 16,” a CTU official remarked. The same rationale applies to the fares charged by Punjab Roadways on this route. Residents have also time and again raised the issue of having a proper bus stand for the township. The present place where buses halt, which is right on the busy Chandigarh —Ropar road, is barely enough to accommodate four buses at a time. Lack of a proper bus stand results in drivers halting on the road, which often creates traffic problems on the single lane stretch. Police personnel complain that dealing with bus drivers is a major headache for them. The first Mercury transit of the 21st century, a rare happening, was spotted and photographed in the city by a local space enthusiast here today. Mr Pradeep Mahajan, a businessman of Sector 16, who had set up his own observation laboratory at his residence, stared through his telescope for more than five hours to get different views of Mercury transit. Talking to the Chandigarh Tribune, the space enthusiast revealed that there were four tangential contacts of Mercury in a span of more than five hours, in today’s celestial event. The first tangential contact known as external tangent occurred at 5 hours, 13 minutes and 48 seconds (GMT). The external points of periphery ie. Mercury’s disc and Sun’s disc came in the line of contact with Mercury at the centre of Sun and the Earth. Mr Mahajan photographed the last contact at 10 hours, 29 minutes and 40 seconds (GMT). The trailing edge of Mercury came in the line of the external tangent of the sun. “However, the first and the fourth tangential contacts were not optically visible. I have photographed the second and the third tangential contact, in which Mercury was spotted as a black object in between the sun and the earth”, said Mr Mahajan. He said this was one of the rarest tangential contacts in the space history of the last four decades. Normally, all tangential contacts occur during November when Mercury is nearest to Sun in its orbit. But this time, after about four decades, the tangential contact happened in May when Mercury is farthest from sun in its orbit. “Mercury is farthest from Sun on May 18”, said Mr Mahajan. Mercury transits take place just 13 times in 100 years. In the 17th and the 18th century, astronomers used to calculate distance between Sun and Earth from this celestial event. An adult Asiatic lion was found dead in the Lion Safari of Mahendra Chaudhary Zoological Park here this afternoon. The mystery surrounding the disappearance of a 19-year-old Kanpur girl, Harveen Kaur, alias Chandni, yesterday ended here today with her parents receiving the news of her arrival at their house in Kanpur today afternoon. The girl had gone missing yesterday morning when she had gone out of the house for a walk but failed to return. Harveen Kaur had married Mr Devinder Pal Singh, a resident of Phase 7, a fortnight ago. Mr Devinder Pal Singh is the only son of a cloth shop owner in the Phase VII market. It was an arranged marriage and, according to sources who know the family, the couple seemed to be happily married. Both telephones of Mr Devinder Pal Singh’s house and shop remained disconnected today. The sources, however, stated that the girl’s parents who had reached SAS Nagar in the wee hours from Kanpur today received a telephone call from their house in Kanpur about her arrival there. Gopal’s has come to Chandigarh. With its melt-in-the-mouth varieties of sweets and snacks. After dominating the Patiala mithai scene for around 45 years, Mr Hari Singh Gopal, gave in to the wishes of his grandchildren to expand to City Beautiful. Their swanky new eatery in Sector 8-C, Madhya Marg, spread over two floors, was thrown open to the city residents on Sunday with much fanfare. And, not surprisingly, they welcomed it with great enthusiasm. For, most of them are familiar with the name and fame of Gopal Sweets, thanks to relatives and friends residing in the adjoining royal town of Patiala who give boxes of their sweets as shagan. If not this, it is highly unlikely that you could have missed their packets of namkeens supplied by major general stores of the city. In case, the name still doesn’t ring a bell, no problem. For, the outlet is here, all yours to explore. Manpreet, the eldest of the patron’s six grandkids, has been given charge of the joint. Armed with an MBA degree, and a gruelling period of training in their Patiala units, both in the kitchen and behind the cash counter, he hopes to win over the taste buds of Chandigarhians. Gopal's has come here with their Patiala hits and more. Prominent among the new items introduced specially for the happening Chandigah are the smooth pastries, eggless dry fruit cakes, cookies, pudding, souffles etc. from the pastry shop equipped with state-of-the-art gadgets and machines.The coffee counter caters such modern combos as cappuccino, Espresso Italian and Mocaccino, to name a few. The multi-cuisine mega outlet has also kept a watch on the palate of the weight watchers with their new range of sugar-free sweets. So, with nothing stopping, you could indulge yourself in the mithai, burfis, rasgullas, halwas, kulfis etc. They also provided special packaging of cartons, boxes, baskets pots etc. adorned with embellishments like ribbons, bows, and pieces of cloth for gifts and shagans. Poori chana prepared in a choice of desi ghee and oil, are the attractions of Sunday outings. Their over 60 lip-smacking snacks and namkeens are de-oiled and scientifically packed to keep them crisp. The chaat-vaat counter promises to leave you pleasantly stunned with the literally mouth-watering gol gappas and chaats, tikkis, kachoris, chilla etc. Vegetarian delights from the Punjabi, South Indian, Continental, Italian and Chinese cuisines are served at the sleek restaurant in the basement. Their specialty is the thali comprising dal, shahi panir, mixed veg, raita, tandoori paratha or naan or 2 chapatis, pulao, salad and papad (Rs 55). The mini thali is made of dal, panir naan, rait and salad (Rs 35). Sample the tandoori sampler plate of seekh kebab, panir shausllik, shami kebab, naan, dal and salad for Rs 55. Also on offer are hot and cool drinks like lassi, milk badam, like soda, Assam tea, lemon tea, coffee, ice-cream shakes and sundaes. THE Sukhna Lake is the right place for having fun and recreation, a place of privacy for young couples. One can sit for hours together and refresh oneself. The lake needs our help. It is the wealth of the city and we will not let it die. People from all over the city are requested to give a helping hand to save the lake by removing the silt from the bed. The government should take steps to maintain cleanliness, remove weeds both in and around the lake. After all it is the pride of Chandigarh. If we volunteer to save it I am sure we will never lose it. The government should start taking steps and it is only with the cooperation of the people that we can save it. An unemployed youth, Sanjeev Kumar, reportedly ended his life by hanging himself at his Maloya residence last night. Sanjeev (22) was married only three months ago. The reason why he chose the extreme step could not be known as no suicide note was found. His father had died earlier and it was his mother who was working for the family. He is survived with his mother, wife and a younger brother. The body has been sent for postmortem. Meanwhile, 27-year-old Alka who had allegedly set herself ablaze last afternoon and was admitted to the PGI with 100 per cent burn injuries died this morning. It is learnt that she wanted a divorce from her husband and for past some months was staying with her parents. She was married in 1997 and was mother of a child. Dowry case: Within less than a year of her marriage to a Jammu resident, Ms Anju Bala of Sector 47, reported to the police that she was being harassed and maltreated by her husband, Anil Kumar, and in-laws to bring more dowry. Acting on the complaint, a case under Sections 406 and 498-A of the IPC has been registered and the investigations will be done by the Women and Child Support unit of the police. Held: The police arrested Mohinder Singh, a resident of Sector 21, from near a private hospital in Sector 34 with 2 gram of smack on Tuesday. A case under Section 21 of the NDPS has been registered. The police also arrested Kabilash, a resident of Bihar, and Mukesh Kumar, a resident of Dadu Majra Colony, from different parts of the city allegedly for satta gambling at public places here on Tuesday. Thefts: Thieves reportedly took away cable wire belonging to the BSNL from Sectors 39 and 40 here on Tuesday. Two cases under Section 279 of the IPC have been registered. Arrested: The local police on Tuesday arrested 11 persons, including three women in an assault case. According to police source , the district INLD President , Mr Ram Gopal Mehta , had lodged a complaint of assault against Nirmal Singh, Gurjeet Singh, Avtar Singh, Ravinder Singh, Jagdish Singh, Raghvir Singh, Dayal Singh , Guljar Singh , Sukhvinder Kaur , Surinder Kaur and Salinder Kaur of RamPur Jangi village . The police had registered a case under Sections 323, 148, 149 and 506 of the IPC. Malaysian furniture has made an entry into Chandigarh with a bang, courtesy the ban on tree felling in the country and the opening up of the market to global players. Brands like Sent In and THS have a collection of Malaysian wooden wares that bring traditional Indian furniture in focus for the changing trends. A market with a massive volume and few customers used to be once a supplier to corporate and government customers, and is known for the collection of quality products in Himachal, Haryana and Punjab. Competing with the Malaysian furniture is Salvan Furnitures that has an Indian collection, giving Malaysian furniture a run for money on the strength of engravings. Divided between two parts along the Madhya Marg, the market has 60 odd shops. Of these, between 20 to 22 are that of the building material. One shopkeeper says it is not a very popular market in the sense that a customer reaches here for everything but does so only when he has exhausted his efforts to find a product. The material here is costlier than in other markets due to a superior quality of products available here. Though the rich people of Himachal like to shop here, the general price-sensitive customer of the state avoids this market. Chandigarh Territorial Congress Committee leader B. B. Bahl’s Hotel President is one of the attractions of the market. Apart from attracting politicians of the Congress from the entire region, it has a coffee shop where food is available round-the-clock. Goel Electric Company, Khanna Watches and Star Plywood are well known names of the market. The market is easily recognisable from Peepal trees seen in large numbers from the Madhya Marg. The market seems to be growing in the shade of these trees which seem to be rarely trimmed. Shopkeepers here dare not do so due to a sense of piety attached to the tree amongst Hindus. Due to an attraction of the Madhya Marg, popular eating joints like Nathus opened their shop here but had to close down as the market does not attract a large number of visitors. The number of visitors is high only for those who come to their offices on the first and second floors. But their daily needs seem to be met by pantries set up in government and corporate offices. Despite the presence of Pizza Hut in the market, the small needs of a large number of employees of corporate and government offices are met by street vendors who serve tea and sell fruits. The market was originally planned to have shops on the ground floor, offices on the first and flats on the top floor. But commercial pressure has led to the disappearance of flats with not a single person using it for residential purposes. The market started coming up after a few of the plots in it were auctioned in the early seventies. Apparently realising the potential of fetching a high value for the plots here, the Chandigarh Administration did not auction all these plots here in one go but sold them in phases. Mr Bahl remembers he bought the plot in 1974 at a price of Rs 1.4 lakh but it took him around 10 years to build the hotel. THS is amongst a chain of Zakaria export houses from Muradabad where Malaysian furniture has found its way in the various sections of each living activity. The store has a collection of wares needed for each living activity. It has a mix of imported and domestic products. The group which had been in the export business for decades has now tried to introduce the Indian customer to the quality of Indian products exported. The Sent In has an entire range of furniture imported from Malaysia along with decorative pieces made of non-wood material. The products here hold your attention for the gloss the material has. Corporate offices and an LML dealer shop is there in the market to make it a multi-activity one. Though the building material dealers here are thought to be of wholesale scale, they are also in retailing. Parking area is short and mismanaged. Shopkeepers want police to enforce parking system along with segregation of cycles, four-wheelers and rehris. The lighting arrangement in the market is inadequate. A few of street lights in the market are not functioning. Though there are toilets for shopkeepers in the market, a common customer does not have the facility of a public toilet. The Peepal trees are unkempt as the Horticulture Department seems to have forgotten trimming them. The parking area has not been carpeted for 15 years. The pattern of tiles in the verandah is not symmetrical as the old tiles fitted by the government have not been replaced. The market has been witnessing waterlogging during the monsoon. Backlane of the market has been encroached upon by certain people. Though the recarpeting of the back lane has been taken up, not much headway has been made. The beautification of the market has not been attended to. There are no utility shops in the market. Cleanliness of the market seems not to have been ever attempted. Traffic restrictions on the Madhya Marg are hindering the growth of business. Active members: B. B. Bahl, Mr Raj, Mr Narinder Singh and Mr Ashok Khanna.